Turn a 5 quart slow cooker on high (for a smaller slow cooker, use about half this recipe). Add the onion and garlic, kidney beans, black beans, pinto beans, tomato, bell pepper and corn. Pour in vegetable stock, salsa, cumin and cayenne pepper. Stir gently to combine. Cook in the slow cooker for 3-4 hours on high, 7 on low (depending on your stock pot). Add salt to taste. 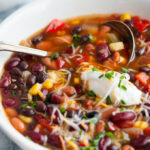 Ladle into bowls and top with green onion, cheddar cheese and a dollop of sour cream (skip sour cream and cheddar cheese for vegan version).